Have you ever said to yourself: If I ignore it…it will clear up in a few days? This may work for a lot of things in life, including some skin complaints like minor rashes, or an occasional eruption of pimples. In other cases, however, ignoring your skin complaint is just plain bad advice, and can be dangerous–even deadly–in the case of suspicious moles or growths. When should you see a skin care professional for different types of skin issues? If you notice a suspicious mole or growth, waiting to see a dermatologist can put you in real danger. Moles that exhibit certain characteristics or that are changing over time could be melanoma, and should be assessed by a dermatologist right away. On average, one American dies every hour from melanoma. Early detection can be the difference between life and death. Many skin growth do not turn out to be cancerous, or they may be a less aggressive form of cancer such as basal cell carcinoma or squamous cell carcinoma. Your doctor will be able to diagnose and treat both serious and minor skin growths. Even if your skin growth is a humble wart, a dermatologist is your best bet for getting rid of it as quickly as possible– and giving you peace of mind! Rashes are fairly common and can be due to allergies, illness, medications, sensitivity to products or chemicals, and even stress. If your skin rash occurred after eating something, being stung by an insect, or shortly after taking a medication, and it is accompanied by swelling of the mouth, tongue or throat and/or difficulty breathing, you may be experiencing anaphylactic shock and require immediate emergency medical attention! With the right treatment, most rashes clear up within a few days, and your dermatologist can help you understand why the rash appeared and how to avoid it or treat it effectively in the future. Acne may not be considered a dangerous health concern, but chronic, unmanaged acne can have a profound impact on a person’s self esteem. Why suffer or watch your teen suffer the negative impacts of acne when a skin care professional can help? Sometimes what you think is acne isn’t acne at all. Other treatable skin conditions such as rosacea or folliculitis can often be mistaken for acne. You may not think to go to a dermatology practice for wrinkles or other aesthetic skin concerns, but it is a good idea. The proverbial “fountain of youth” is a multi-billion-dollar industry, which means there are many competing messages, false claims, and expensive-but-useless products out there, and it is hard to tell fact from fiction. With all of the confusion, why not consult with professionals who know the true science behind skin care and anti-aging? On top of that, dermatology practices can sell medical grade skin care products that are stronger and more effective than those you can buy at a drugstore. That means you get a more potent product that will get you better results, as well as the benefit of a doctor who can make the best recommendation for you based on your medical history and skin type. There are also in-office dermatological procedures such as chemical peels, laser and light treatments, fillers and injections that can help you reach your aesthetic goals. 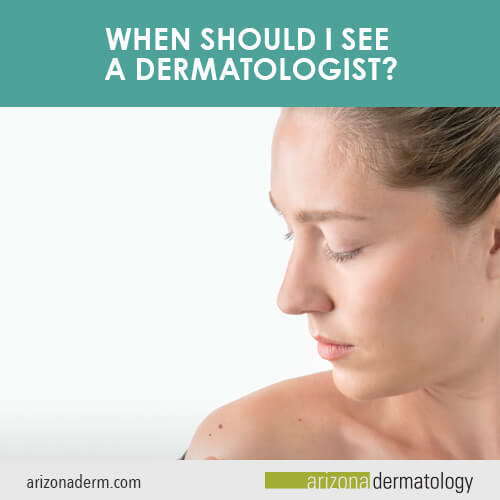 When should you see a dermatologist for cosmetic or aesthetic reasons? Dermatologists are also the professionals to call for nail health, hair loss, or diseases such as psoriasis and eczema. Have a concern about your skin? Call us for an appointment today.